Many people enjoy recreational cycling as a fun and relaxing means of getting a great cardiovascular workout. However, trying to transport your bike in the back of your car can be a difficult endeavour. This is where bike carriers come in,helping to keep cars and bikes safe during transport. This article explores some of the considerations you should keep in mind when choosing a bike carrier to transport your bike. The first consideration should be what type of vehicle you drive. Most bike carriers are designed to work with a variety of different types of bikes, so you must first look at your vehicle and see what types of carrier will work with it. This will allow you to narrow down the options and find one that best suits your vehicle. Do you have a hitch receiver? What class is it? If you have a Class II or higher hitch receiver, you’ll be able to buy a hitch-mounted bike rack. A hitch-mounted rack will mount right in the hitch receiver and will allow two to six bicycles to ride behind your vehicle. This is a convenient option that allows you to easily transport your bikes without having to take off their wheels. If a hitch-mount rack for your bike is right for you, it’s a good idea to look for one that allows your bike to stand in a tray. Also, you need to consider if you require access the back of your vehicle when the hitch-mount rack and bikes are attached. If so, look for a hitch-mounted rack that swings out of the way of the rear end for easier access. If you don’t like the idea of your vision being obscured with bikes dangling behind your rear window, you might want to consider a roof-mounted rack. This will only work if you have crossbars installed on the roof for the rack to be attached to. If you don’t have crossbars on your vehicle’s roof but prefer this option, you will need to have sturdy crossbars mounted. With roof-mounted bike carriers, you’re limited to only two bicycles, and you’ll need to be aware of your vehicle’s altered height clearance. If security is important to you, you should also look for a roof-mounted rack that allows you to add locks. 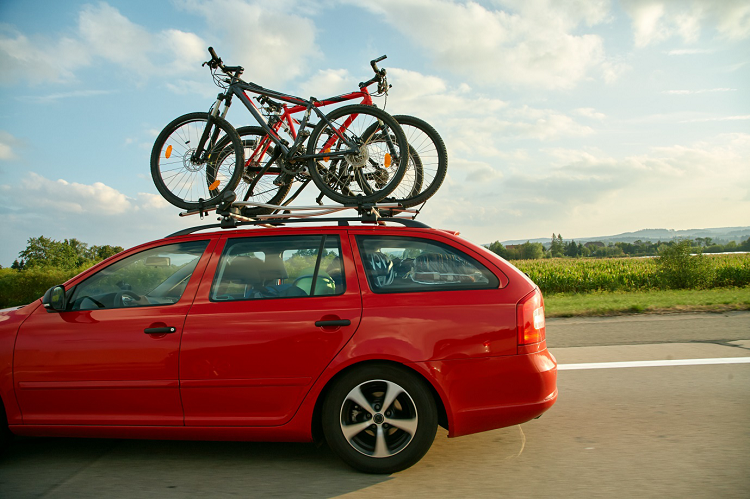 If your vehicle has a trunk, you’ll likely be able to install a trunk-mounted bike carrier. With this type of carrier, nothing needs to be drilled into your vehicle. Instead, straps keep the carrier mounted to your vehicle, with big rubber pads that keep the carrier in place. However, you will lose the use of your trunk while your bike is in transport, unless you take it off and unhook the entire carrier. If you opt for this type of carrier, you’ll need to consider whether the carrier can fold and fit in your trunk when not in use. If you have bikes with non-traditional frames, look for a carrier that has wide spacing between the bikes on the rack.